I attended ICAST / IFTD - the world's largest sportfishing and fly fishing trade show - a couple weeks ago in Orlando. I've been compiling on my blog some of the new or more interesting products I saw related to fly fishing and kayak fishing. The url is www.nonewtailstotell.blogspot.com. The posts are compiled by category (kayaks, rods, reels, clothing, etc.). Keep checking back as new categories are added... should be completed by early August. Hope this provides some interest - maybe even excitement - to KFF members as you ponder items for your Santa list this Christmas. 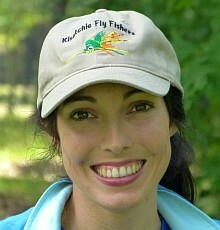 The next meeting of the Kisatchie Fly Fishers will be on Monday, July 20 at the Rapides Westside Library in Alexandria. Time is 6:30pm. The public is welcome, so bring a guest if you can. Please note: there is -no- fly tying session this month. We’ve moved the general meeting from the usual 4th Monday date to the 3rd Monday. This is due to the library’s Summer Book Sale the last week. For this meeting, we’ll have Burley Johnson and possibly other members of our neighboring club - the Cane Country Fly Casters in Natchitoches - who will make a special presentation to our club. Also, Catch Cormier will give a brief recap of some of the new products he saw and tested at last week’s ICAST trade show in Orlando. Also: the July, 2015 issue of our newsletter, Leaders and Lines, is now available online in PDF format (901kb). Click here to download. 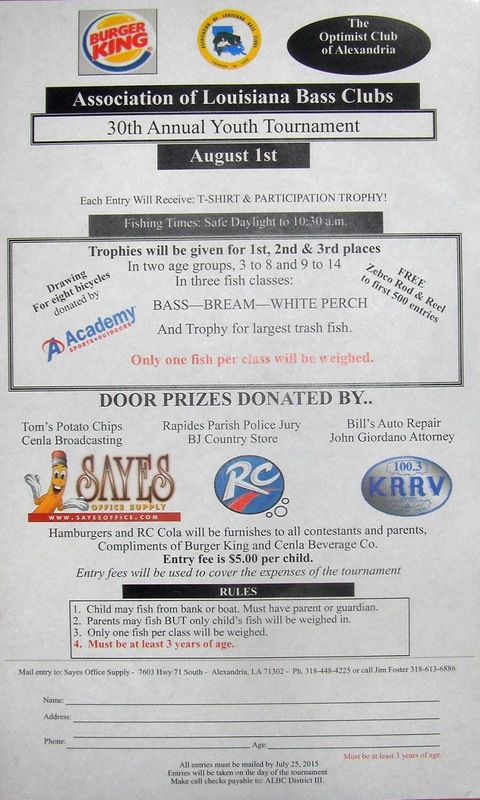 Entry fee: $5 per child includes t-shirt plus hamburger and RC Cola compliments of Burger King and Cenla Beverage Co.
Trophies for 1st, 2nd, 3rd in each age group for each species: bass, bream, white perch. Free Zebco Rod and Reel to first 500 entries. Drawing for 8 bicycles donated by Academy Outdoors. To enter, click on image, print it out, then mail to Sayes Office Supply, 7603 Hwy 71 South, Alexandria, LA 71302. Mail entries must be received by July 25th. Onsite entries day of the tournament also accepted. "A Day with Davy Wotton - Mastering the Nymph"
Registration for this event is now open. Pre-registration required as seats limited to 75 participants (see form link below). This is a great event, with something for all levels of fly anglers from beginners to experts. Held at the beautiful Red River Refuge complex overlooking Lake Caroline. Seats often fill up weeks in advance, so register asap! Click here for registration form including details of the seminar.